For every 150 women who stop taking Premarin, one mare is spared from the “pee line” and seven “byproduct” foals are not be slaughtered for their meat. The Int’l Fund for Horses is working to end the use of medications derived from conjugated equine estrogen (CEE), or pregnant mare’s urine. Mares, foals and women are all at risk. The mares and foals cannot speak for themselves, but women can, and should, for the horses and for themselves. We ask that women please prepare the following letter and send it to their physicians. If you are a woman not experiencing menopausal symptoms, please edit the letter to fit your circumstances (omit the last paragraph and end with a thank you). Both men and women should share this with the horse lovers and women in their lives. As a concerned and knowledgeable patient regarding the use of the conjugated equine estrogen produced drugs Premarin® and Prempro®, I encourage you to stop prescribing these medications for relief of menopausal symptoms. 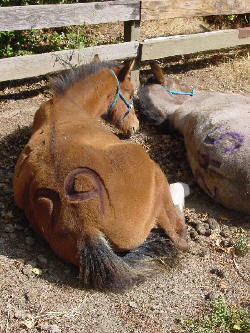 Premarin® and other such HRT compounds are derived from the high concentration of estrogen in pregnant mare’s urine (PMU). Not only is the collection practice inhumane but the risks imparted by these drugs to unsuspecting women are objectionable and unnecessary. Many believe that the risks far outweigh any benefits offered given that these particular medications are recognized by the United Nations as potent carcinogens. Life for PMU mares is merciless; repeatedly impregnated for up to as many as 20 years, they spend 6 months of their 11-month pregnancy confined to stalls so small they have difficulty turning around or lying down. During this time, they are permanently connected to cumbersome rubber urine collection bags that chafe their flanks, cause infections and severely limit movement. Water intake is routinely restricted to concentrate the amount of estrogen in their urine causing life-threatening renal and liver problems. Equally disturbing is the fate of the foals – the “by-products” of the industry. Most are sold at auction to “kill buyers” and ultimately end up at the slaughterhouse. Nationwide studies (e.g. NIH’s Women’s Health Initiative) have been published that clearly corroborate the link between HRT, cancer, heart disease, stroke and dementia. Women who take these drugs face significantly increased risks of: invasive breast cancer (26%), heart disease (29%), strokes (41%), blood clots to the lungs and legs (50%), ovarian cancer (60%), impaired cognitive function, dementia and Alzheimer’s, asthma, lung cancer, malignant melanoma, and reduced insulin resistance, among others. Most importantly, when these medications are stopped, a woman’s risk returns to the same level as those who have never used these therapies. Noteworthy are the on-going lawsuits against Wyeth (now a Division of Pfizer), the manufacturer of the Premarin® family of drugs. Juries and Judges alike have shown that Wyeth failed to adequately warn consumers about the risks associated with these drugs and that they purposefully hid the risk of breast cancer and other diseases. Moreover, evidence has confirmed that Wyeth employed ghostwriters to write medical reports related to HRT and paid physicians to sign off as the authors. Not only did the articles overstate the benefits of HRT, but they diminished the serious risks associated with the drugs. I believe there are safer and more humane alternatives available. However, as always, before trying these alternative remedies, I would like to discuss these options with you. Thank you, Jane, for your stellar work and leading our Team in this effort. I too am horrified to learn this was the process used to make the medication (Premarin) that I began taking at the age of twenty five following a complete hysterectomy. I took this med for almost twenty years.! Pray for a massive change to this barbaric practice and education for the doctors still prescribing it, if enough people..make enough noise, then maybe we will see alternatives to this particular medication. Premarin made me sick. I had all the side affects. Premarin is actually not the right HRT to be on when you’ve had a hysterectomy. You should be taking Estrofem . HRT specially for women that have had hysterectomies. You can google it. I did. I also have osteoporosis to the extreme. And my Gyn told me this would help not to keep losing calcium from my skeleton. Actually, truth be known, it is the Premarin. That stops the cancer from starting. I am on HRT because I am stuck in menopause for decades with hot flashes every hour on the hour so that I could not sleep, work or have a life. It was when I forgot to take the Premarin that I began to bleed daily. This was of real concern to my Gyn & MD. Plus I was warned not to forget my Premarin or I would possible get cancer. 1000s and 1000s of women who filed and won class action lawsuits related to the cancer causing properties of Premarin and their lawyers would heartily disagree. So would the World Health Organization who designated equine estrogens as a known carcinogen. We find it very hard to believe that a potentially cancer causing drug would stop cancer. If you feel confident in your physician then so be it. We wish you well. However, there are alternatives — many alternatives in our opinion that are kinder and gentler that women take successfully that can be explored with a competent, ethical physician. Wow, are you misinformed, as are your physicians who have probably been bribed by Big Pharma – many are however, so that is not surprising. There is a wealth of knowledge out there that is diametrically opposed to what you claim. Why do you suppose all the warnings on the packaging referencing the dangers of HRT? Even the pharmaceutical companies acknowledge this to protect their a** to avoid the lawsuits Vivian is referring to. Take at your own risk is the bottom line. And that’s the power the drug industry has over you. Very sad. As a voice for the animals I can’t express the pain, suffering and anguish these animals endure. This sad, disgusting and unnecessary. this makes me sick!!!! D-‘: i want someone to make this in the News News papers and something that goese around the world so people no what they are taking in them when they take these meds!! Stop killing these horses just to make a medication and for profit. STUPID PEOPLE. WAKE UP. I am horrified to think I was on that stuff for some 20 years! I had no idea these were the conditions under which I was treated, and now that I know, what on earth can be done to stop this heinous practice? Mankind is going to the dogs–an evil, hideous shadow of himself. I was on Premarin and it made me sick. All the symptoms of the side affects I had. I had a full hysterectomy 23 years ago and the dr put me straight onto Estrofem. That is especially for women that have had hysterectomies. You can google it. I did. I stopped the Premarin immediately. I TOO BELIEVE THIS IS SO WRONG. WHENEVER A MED IS USED THAT HARMS ANIMALS IS WRONG TO USE IT. THIS IS SO WRONG. WHENEVER A MED IS USED THAT HARMS ANIMALS IS WRONG TO USE IT.